In medium bowl, beat egg. Stir in chili sauce, onion, crushed crackers, peppered seasoned salt and ground beef. Shape mixture into 4 patties, 1/2 inch thick. Spray 12-inch nonstick skillet with nonstick cooking spray; heat over medium-high heat until hot. Add patties; cook 4 to 6 minutes or until browned on both sides. Drain if necessary. In medium bowl, combine potatoes, tomatoes and gravy; mix well. Pour over patties. Bring to a boil. 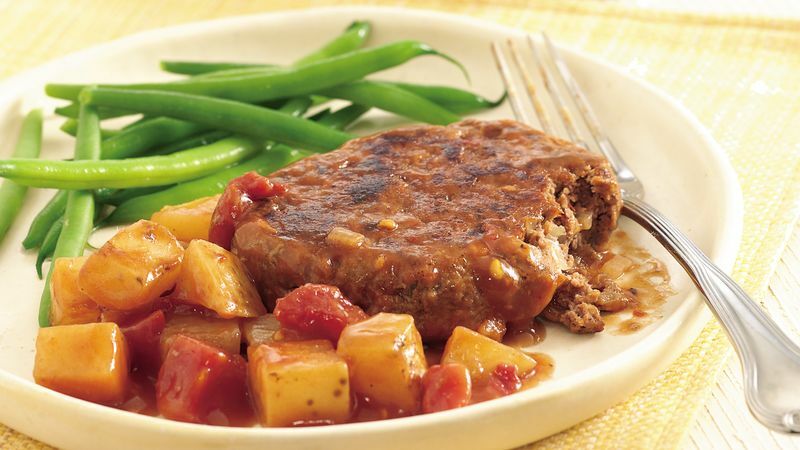 Reduce heat to medium-low; cover and simmer 15 to 20 minutes or until potatoes are tender and beef is thoroughly cooked, turning patties and stirring once. To reduce the fat in each serving of this recipe by about 8 grams, use lean ground turkey in place of the ground beef, and fat-free egg product in place of the egg. Each serving of the lower-fat version has about 65 fewer calories than the original ground beef version. Caesar salad is a classic accompaniment for this easy beef recipe. Toss a package of prepared salad blend with purchased dressing and top with croutons and shaved Parmesan cheese.